Coos Bay, Or. 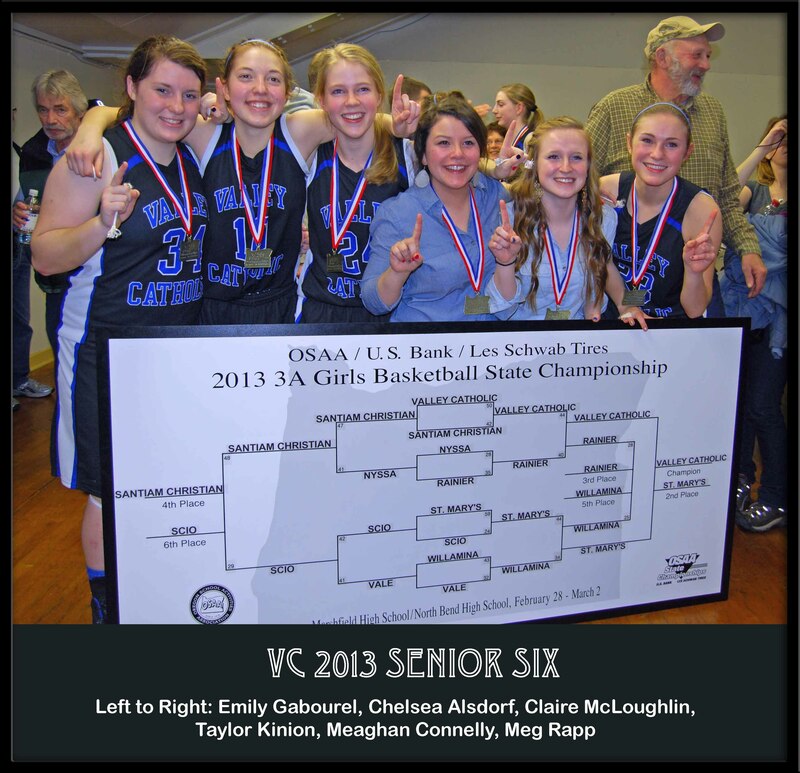 Going into the March 1st, 2013 Oregon State 3A girls’ basketball semifinals at Marshfield High School, the Valley Catholic High School Valiant seniors had dueled the Rainier High School Columbian seniors eleven times since their freshman year. The rivalry predates Valley Catholic’s entry into the Lewis & Clark League, and the VC squad owned a slim lead of six wins against five losses in this classic high school rivalry between schools, players, and coaches. In the series Valley Catholic averaged 44.2 points per game, while Rainer averaged 41.2. In the 2011 district playoffs Rainier defeated Valley 51-37 to gain a spot in the state tournament. VC stayed home. In 2012 VC won the Lewis & Clark League in the regular season, but Rainier came out on top in the district tournament finals. VC returned the favor by defeating Rainier in the semifinals of the state tournament. Rainier finished 5th and VC finished 2nd in state that year. In 2013 the top ranked Valiants were riding a twenty-two game win streak into the Columbians’ gym on February 1st. Along the way the Valiants had defeated the eventual 1A girls’ champion, Damascus Christian, the eventual 2A state champion, Regis, and 4A’s 4th place team, La Salle Prep. None of that mattered to Rainier as they pinned Valley with their first loss of the season, 52-45. It was not a matter of rising to the occasion. Rainier was simply that good… but I am getting ahead of myself. This story really begins back in the year 2000 when five families enrolled their daughters in kindergarten at St. Mary’s of the Valley Grade School, now known as Valley Catholic Grade School. Never could they have dreamed what these girls would accomplish both athletically and academically in the years to come. Meaghan Connelly, Emily Gabourel, Taylor Kinion, Claire McLoughlin, and Meg Rapp have been classmates longer than they have been teammates, and they have been teammates since their 2002 Aloha Youth Soccer Club team. 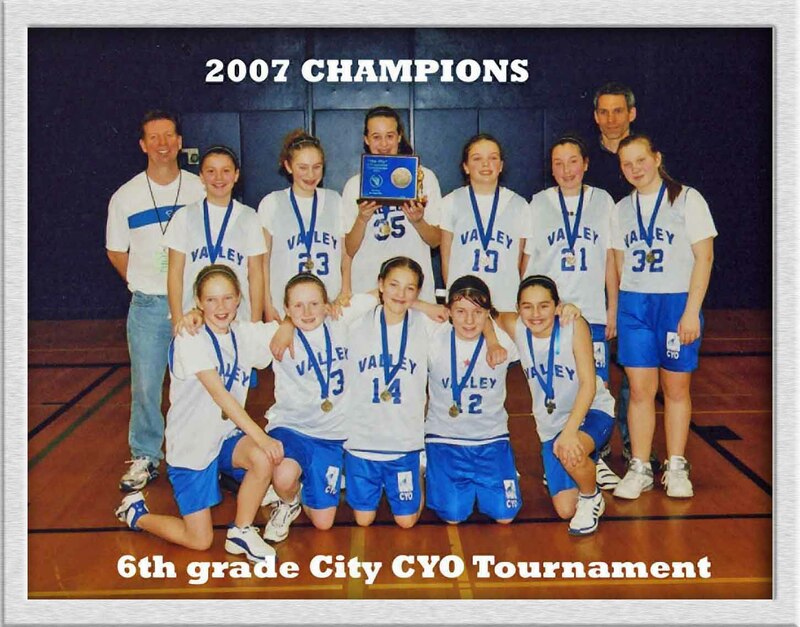 They formed their first CYO basketball team in 2003, and won their first CYO Portland City Basketball Championship as fourth graders at the end of 2004-05 season. In the fall of 2006 a new student, Chelsea Alsdorf, joined the SMV girls, now in sixth grade. Chelsea was an avid athlete, and quickly found a home playing soccer and basketball with her new classmates. As a team, they went on to win three more CYO Portland City Basketball Championships, and Chelsea, Emily, and Meg won the 2007 Oregon Youth Soccer Association’s President’s Cup while playing for Tualatin Hills United Soccer Club. In these days when private schools are often accused of recruiting athletes, this group of girls is as homegrown as apple pie and the Fourth of July. In the meantime, a young teacher named John Innes joined the Valley Catholic High School English department in 2003. Innes knows basketball, loves coaching, and took the reins of the women’s varsity basketball program for the 2004-05 season. He is a dynamic, creative coach whose active mind never stops strategizing. In his first eight years as a head coach, he won five league championships and his peers named him coach of the year four times. His teams finished 2nd in state twice, 3rd once, and 4th once. His archrival and good friend, Doug Knox, has been teaching junior high math and coaching for Rainier for over twenty years. In 2008 and 2011 Knox was named league coach of the year, and Rainier won back-to-back league championships in 2007 and 2008. Knox’s girls ran the table in 2008, going undefeated and winning the Oregon 3A title. Each coach believed he had something special when the ‘Class of 13’ players came out of middle school and joined the high school programs. As the young women developed and worked their way into the varsity lineups, their abilities, intelligence, and heart did not disappoint. Both teams thrive on a steady diet of gut-wrench, desire, and adrenaline. Both teams are 2013 Academic All-State squads with average GPAs over 3.5. As their rivalry progressed there were few secrets and few surprises between Innes and Knox. The two coaches, as well as the players, came to know each other’s habits, strengths and weaknesses. For four years the rivalry’s winner had been determined largely by a handful of missed shots and bad calls by OSAA (Oregon School Activities Association) referees. 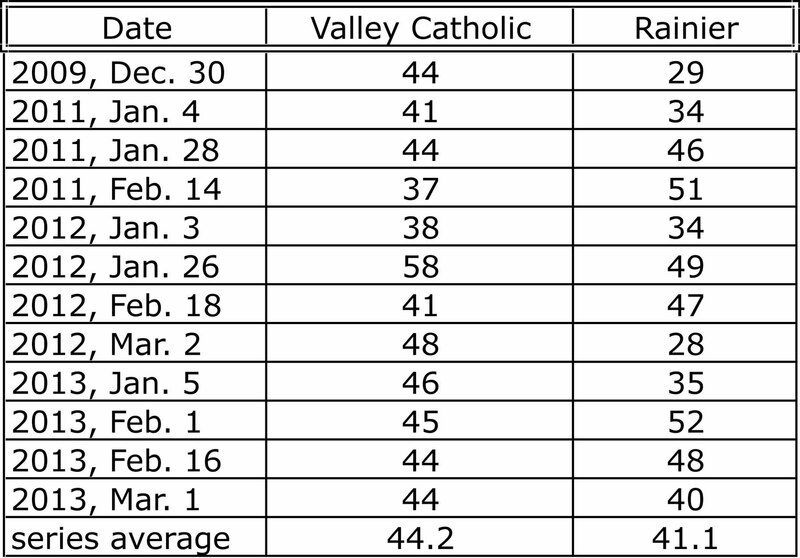 As the 2012-13 season progressed, it became clear, at least to Valley Catholic and Rainer, that they were the two best teams at the 3A level in Oregon. Not only did Rainier hand VC their first loss of the season, they also stuck them with their second. In a repeat performance from the 2012 season, VC won the 2013 regular season league title only to be defeated by Rainier 48-44 in the district tournament finals. The OSAA follows a strict RPI math formula to determine state tournament seeding. An early season loss cost Rainier dearly as the season progressed, for though they defeated 1st ranked VC twice, they could not climb above 4th in the OSAA rankings going into the state tournament. This placed Rainier in the same side of the state bracket as VC, setting the teams on a collision course for the semifinals. Only one team could go through to the championship, while one would be forced to play for the third place trophy. Bitter losses season even the greatest of athletes before they achieve their greatest successes. There is no way to prepare for dealing with the pressure of the clutch championship performance without actually experiencing it first hand. Both Rainier’s and VC’s girls had stomached more than one championship loss in the previous year. Rainier’s basketball team finished the 2012 season with two straight losses in the state tournament, and their softball team lost a heartbreaking 0-1 game to Santiam Christian in the OSAA 3A State semifinals. VC’s girls were handily beat by Vale in the 2012 3A basketball finals 43-29, and lost a heartbreaking 2-1 match to Oregon Episcopal School in the 2012 OSAA 3A state soccer championship game. As both teams packed their bags and prepared for the long journey to Oregon’s south coast and the town of Coos Bay, they were no longer satisfied simply to be there. They were heading to Coos Bay to win it all. Nothing less. Rainier opened the playoffs by thrashing the Pleasant Hill Billies (a team that easily has the funniest mascot in all of Oregon, even better than the Tillamook Cheesemakers) 60-46, and then handled the Nyssa Bulldogs 35-28. Valley Catholic opened the tournament with a workman like victory over Westside Christian 47-37, then cruised past Santiam Christian 50-42. Next up for both squads was the 3A state semifinals and the twelfth and final meeting of the seniors of Valley Catholic and the seniors of Rainier. The Marshfield High School gymnasium is a grand, two level venue designed to accommodate large, raucous crowds. On the afternoon of March 1st, 2013, it quickly filled with expectant, vocal fans from Beaverton and Rainier in anticipation of the semi-final match between the two Lewis & Clark League rivals. The Valley Catholic pep band, led by former Crazy-8s rock-n-roller, Dan Schauffler, rocked the arena while students from both schools cheered for their team. Both teams started out hot in the first quarter, trading baskets and fouls. With their aggressive, physical play, Rainier pulled ahead in the second quarter and early in the third quarter, but at a great cost of fouls. At one point in the third quarter they owned a dominant 12 point lead over VC, but their two stars, guard Kaylea Knox and post Kylee Crape, were close to fouling out. Knox and Crape could not afford any more aggressive play, and this allowed VC to climb back into the game going into the fourth quarter. With Rainier clinging to a thin lead late in the fourth quarter, guard Kaylea Knox committed her fifth foul on Kaylynn Bush as Bush drove to the basket. 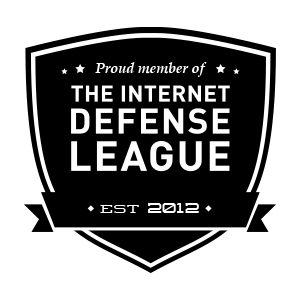 Knox was gone. It was a bitter moment for Rainier as a clearly frustrated Knox left the floor, for it looked to be a terrible call by the referee. Even I did not believe it until I reviewed my video tape frame by frame. Indeed, Knox was the first Rainier player to foul Bush as she put up the ball. Crape was the second. Either way, one of them had to leave the game. While heartbreaking, it was a good call. Without Knox to run the floor, Rainier could no longer handle VC’s tenacious backcourt press and defense. Quick turnovers and more fouls helped VC take its first lead since early in the second quarter. Down the stretch Kaylynn Bush, Lindsie Labonte, Emily Gabourel, and Chelsea Alsdorf put down 7 of 10 free throws and the Valiants emerged with a 44-40 victory over the Columbians. This final basketball contest between two talented groups of seniors came to its bittersweet end. The following day, March 2nd, 2013, an exhausted, disappointed Rainer gutted out an overtime victory over the West Valley League champions, Willamina, 28-25, to finish 3rd in state. Valley Catholic ran over the Southern Cascade League champions, St. Mary’s of Medford, 40-27, to win their school’s first ever Oregon state championship in girls basketball. Valley reveled in the thrill and glory of finishing their journey as champions, while Rainier digested disappointment. There is little solace knowing the semifinal contest between the Valiants and Columbians was the premier game of the 2013 tournament and should have been its final. Sport, by its very nature, cannot be fair and equitable. All it can be is opportunity. The league awarded Coach Innes ‘Coach of the Year’ honors for the fifth time, only this time he had an Oregon State Championship to go with it. Exactly 90 days later, on May 31st, 2013, Rainier seniors Kylee Crape and Kaylea Knox led the Columbians to the OSAA 3A softball state championship with a 9-3 thrashing of the Dayton Pirates. Now that it is over, I want to thank the Valiants and Columbians for showing such exemplary sportsmanship during their long running rivalry and wish them all the best of luck in the future.